I took this picture while visiting Dr. Kessler’s Prairie Garden in Indianapolis, Indiana. I wanted a picture of the flowing field and all its texture and movement. I was a little freaked out when I downloaded the pictures and saw what else was in this field! The last few days have been very interesting. In a few short weeks my day job has gone from being a venue that I dealt with confidently (annual and container plantings for a large development company) to the huge learning curve job of overseeing the company’s entire landscape and irrigation installation department. I look in the eyes of those I work with and see “but she’s just the ‘the flower lady’” and almost hear their heads rattle as they shake them in dismay. The term ‘the Peter Principle’ seems to be on everyone’s lips. Was this a position I sought and fought for? No. Is this a position I embrace. Of course. It never occurred to me that I couldn’t do this job. My only concern has been, “How long until I can do this job with excellence,” and “will I be given the tools to learn my job well.” I tend to ignore the Peter Principle, which is the idea that in business, people are promoted into jobs with duties they cannot fulfill, and hope my focus is more on Peter’s principles. You may have heard of Peter – he was fisherman who became a disciple of Christ, who was always sticking his foot in his mouth, who seemed to act first and think later, yet Christ chose him to be the person to help build his church. And Peter wrote two letters, the first of which spoke some of how I should handle my responsibilities as an employee (I Peter 2:13-21) by showing respect to all those around me, to do good in all I do, and to serve diligently those I serve. Peter’s life was about hard work, having a teachable spirit, and not being afraid to face his mistakes and learn from them. His influence was felt more deeply because he knew he needed the help of others. The more I thought about living out Peter’s principles, the more I thought about the stories I have followed over the last few years of two very different Katie’s. 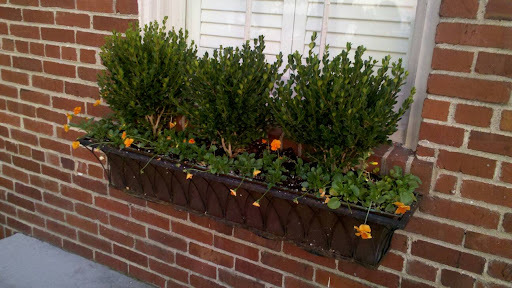 Katie deSwanville has a blog called NorCalKatie and I enjoy her thought provoking post and perspective on life and gardening. I gained keen interest in her writing, though, when I read that she had been stricken with spinal meningitis and hovered near death for months. She faced an obstacle that destroys many lives, yet the moxie that I enjoyed in her pre-meningitis days when she would face life’s obstacles and proclaim, “Bring it!” seemed to be her subconscious battle cry in her long recovery. There are no skills for battling death, there is only a passion to live. This is a gal who seems almost polar opposite to most of what I believe socially, politically, and spiritually. But her mantra is “Be not afraid of death. Be afraid of the unlived life.” The learning curve seems to be her mode of operation. The other Katie is another 20 something who left for Uganda at age 18 for a year of mission work and has ended up being foster mother to 15 young women and starting a mission to educate and care for hundreds of orphans in this war ravaged country. Katie Davis had no formal skills to do what she did (you MUST read her book, Kisses From Katie), but she had plenty of passion. Her young life has inspired and influenced more lives than most folks ever will, and the thought, “Can I do this?” never seems to part of her forward motion. So I’m thinking that as I plan to stay away from ‘The Peter Principle’ and follow Peter’s Principles, I might just start saying I’m using the Katie Principle – to look at what is set before me, to use the passion that has driven me to this industry (what a great way to ‘Cultivate a Culture of Gardening’ by setting an example of good gardening principles in landscape installment! ), and look that learning curve in the eye and proclaim, “Bring it!”. 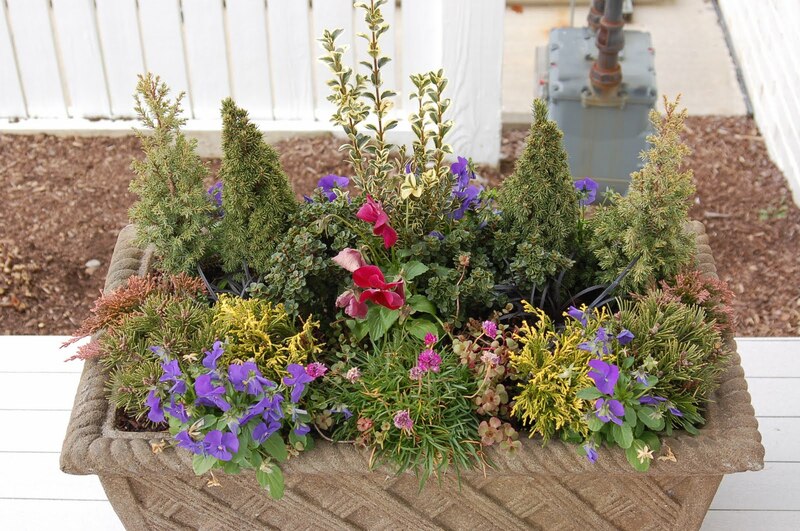 Supertunia Indigo Charm petunia with Saffron calibrachoa, verbena, and Russellia surround a Variegated Lemon Tree. 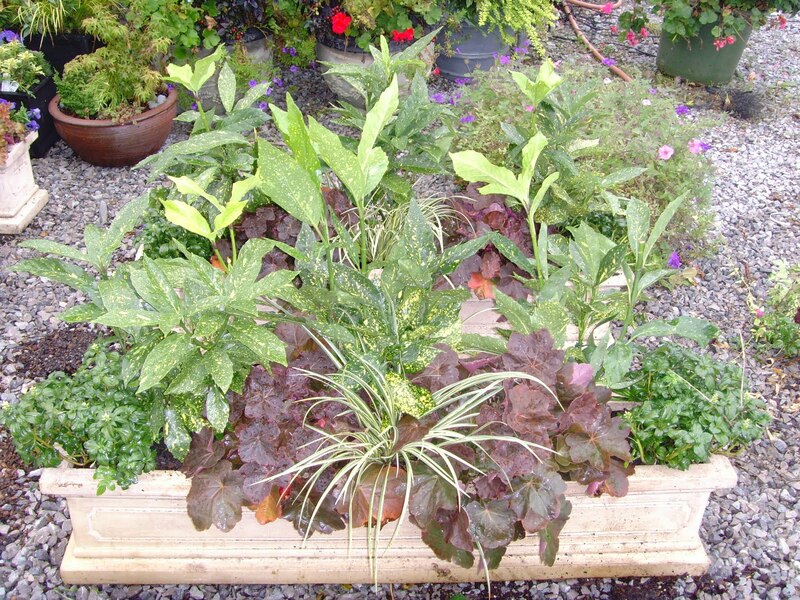 There are TWO chances to win a container gardening prize! 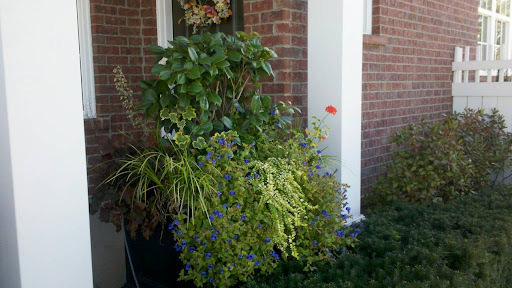 To Win the Fabulous Proven Winners Prize Package (see Sneak Peak at 365 Days of Container Gardening Giveaway!) all you have to do is make a comment on this post and let me know what is your favorite container from this past year. 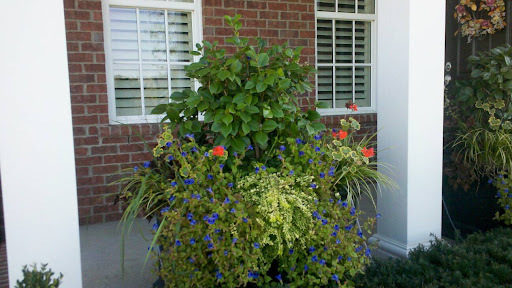 facebook page – LIKE my facebook business page and leave a comment on the post that says “WIN A Campania container”. You have until Sunday, Oct. 9, at 3pm to leave your comments (that’s about the time I either wake up from my Sunday afternoon nap or about the time the Titan’s game is over). The winner will be chosen from a random drawing. 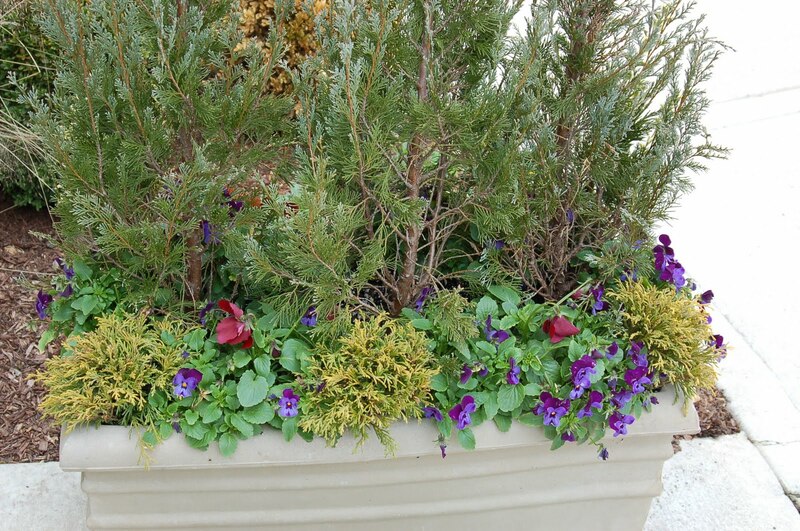 Thank-you for this year of support and fun comments and stay tuned for the kick-off of 366 Days of Container Plants! 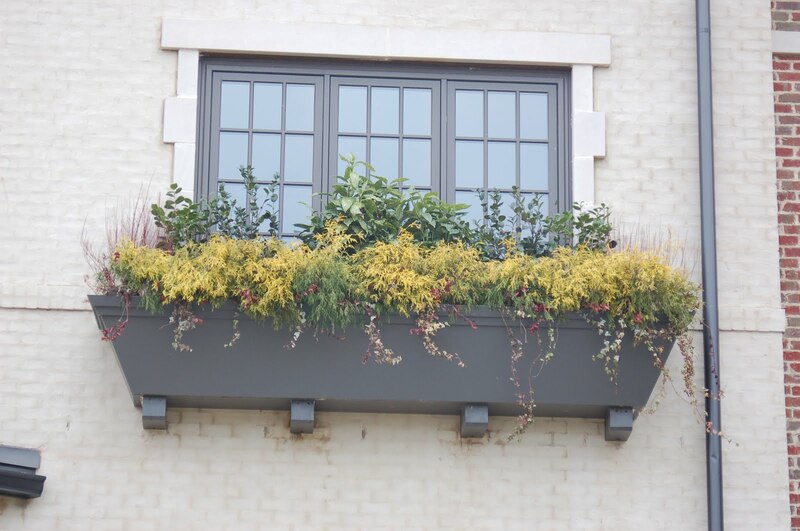 Sitting at Boxwood Bistro tonight waiting for my friend and had to snap a picture of these simple, pretty, and easy windowboxes. The Proven Winners plant won’t be hard to find in this one. 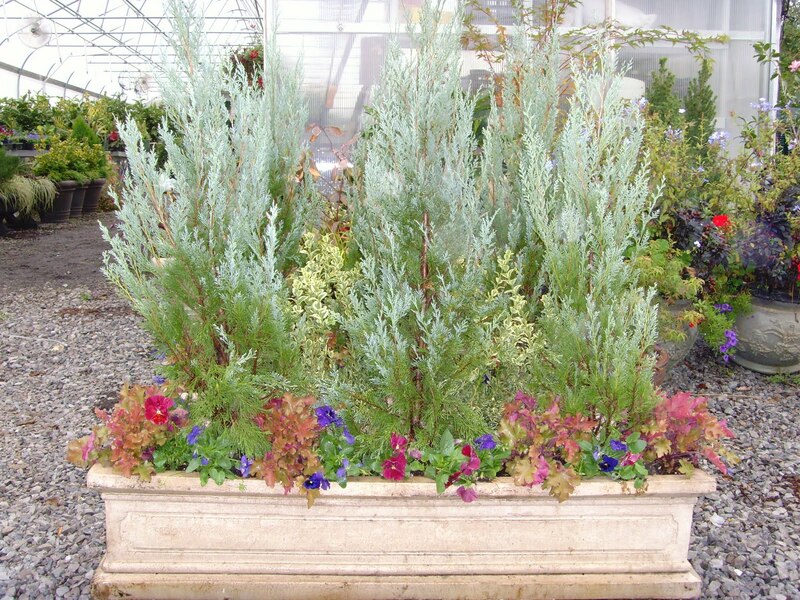 And check back tomorrow to learn the answer to all the mystery plants and see how you can win my Grand Finale Giveaway! 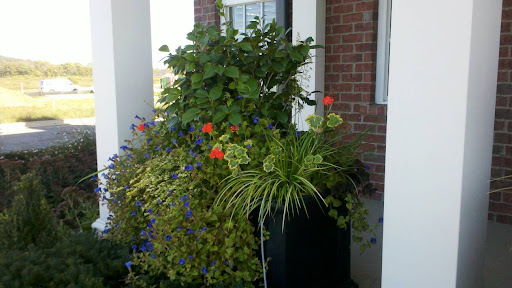 If you don’t know why I want you to try and guess the Proven Winners plant in this container, scroll down to The Great 365 Days of Container Gardening Giveaway and see what all the fun is about. Only two more days to have fun guessing (you don’t have to have a correct answer to win; you just need to comment on day 365). By the way, Darla is on a roll! Day 362 – These Fourteen Hour Workdays Are Wearing Me Out! But fall is high planting time so I’m glad I have a job and there is plenty of work to do. 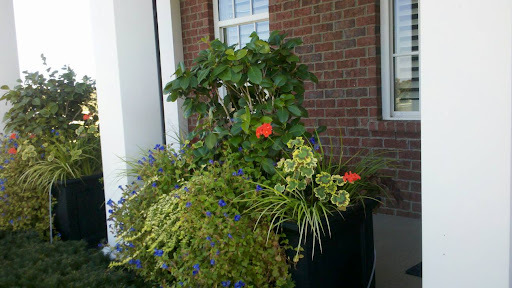 These are some containers that my co-worker, Yelena, did last spring. 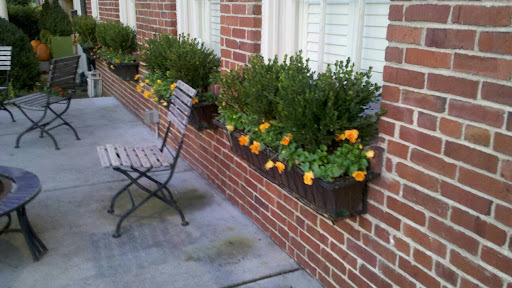 I got to enjoy them today while I was planting pansies in front of this client’s home. And there is a Proven Winners plant amongst all that beauty that you get to guess at. Only 3 more days until all those good guessers get to find out if they were right! I’m thinking I need to do 365 Days of Molbak Garden and Home store. I love this place! Thank you, Alison Conliffe, for taking the group to this store! Here’s a succulent bowl from Molbak’s that was very striking. This might be a tougher Proven Winners plant to name. I have to be honest with you (ok, I’ve probably been a little TOO honest with you over the years) but I’m feeling a little superficial. As I sit here writing about the AWESOME countdown to day 365 and the big Giveaway, I’m thinking about my precious daughter-in-law. Alexandra, the first of my two daughter-in-laws, has a countdown going of her own. Except hers carries a greater weight of significance than my silly little countdown. You see, in 49 days her darling husband, who is also my darling son, will be returning from 8 months of military duty in Afghanistan. So I’m thinking that my little flower container countdown will mean that in reality, at Day 365, we’re only 44 more days away until Jonathan comes home. And the hint for today’s Proven Winner’s plant for you to guess – the cultivar name of this plant is also the name of this darling son’s favorite fruit when he was growing up.